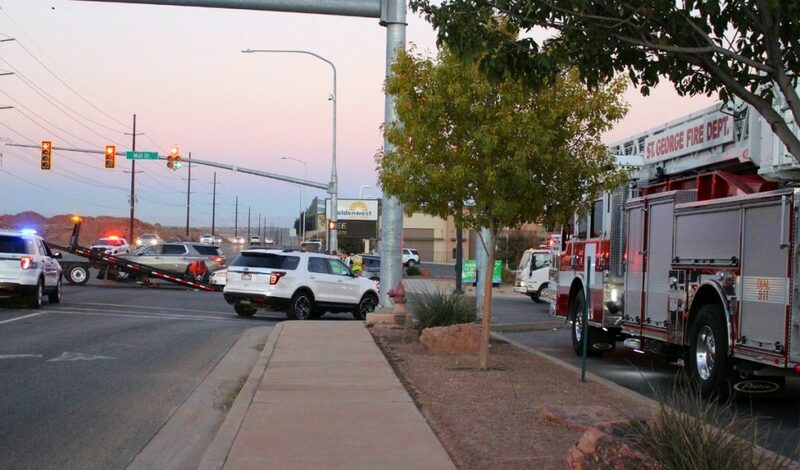 ST. GEORGE — Limited vision caused by the exhaust of a large diesel truck reportedly contributed to a T-bone crash in a busy intersection Wednesday. 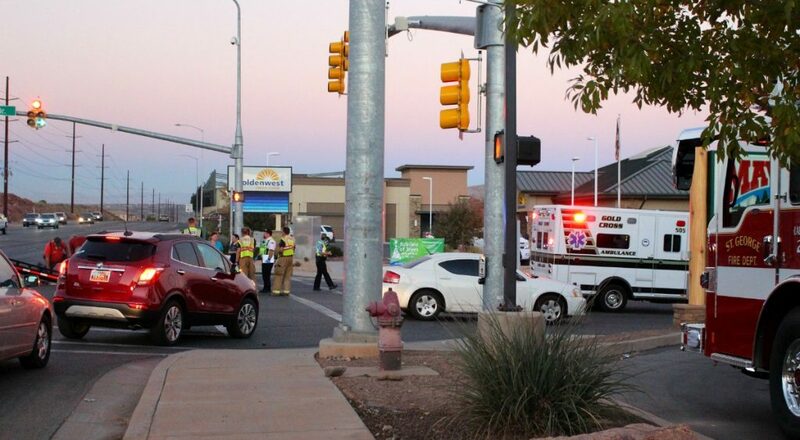 Shortly after 5 p.m., officers and emergency personnel were dispatched to a crash at the intersection of S. Mall Drive and E. Riverside Drive involving an SUV and a white Toyota Camry. Officers found the Toyota in the middle of the intersection extensively damaged and blocking the outside lane of Riverside Drive, causing eastbound traffic to come to a stop. 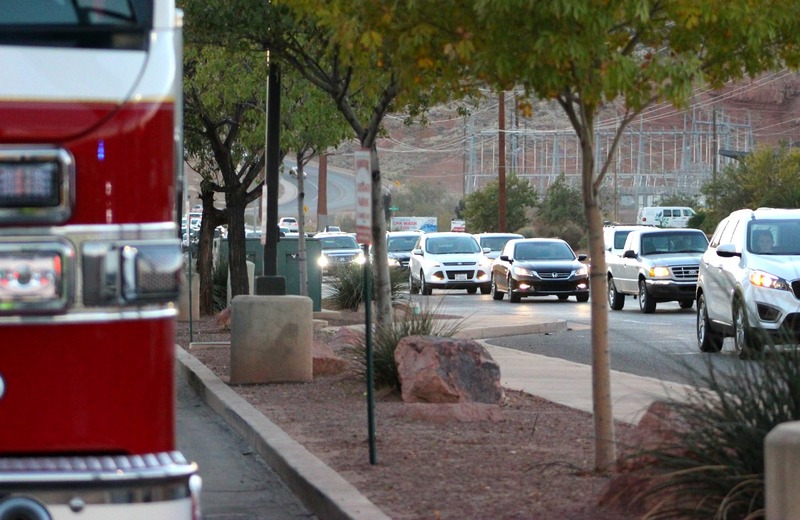 The long line of cars began to move once traffic was redirected into a single lane. The collision was reported as an injury crash, but responders found that none of the occupants in either vehicle suffered any serious injuries or had to be transported to the hospital. After speaking with the drivers and witnesses, officers learned the Toyota was heading west on Riverside Drive when the driver entered the left-turn lane directly behind a large truck as the SUV was heading east on the same road, St. George Police Sgt. Choli Ence said. The truck accelerated as it entered the intersection and was able to make the turn while the traffic light was still yellow, sending a large plume of thick smoke back toward the Toyota which obscured the driver’s vision in the process. 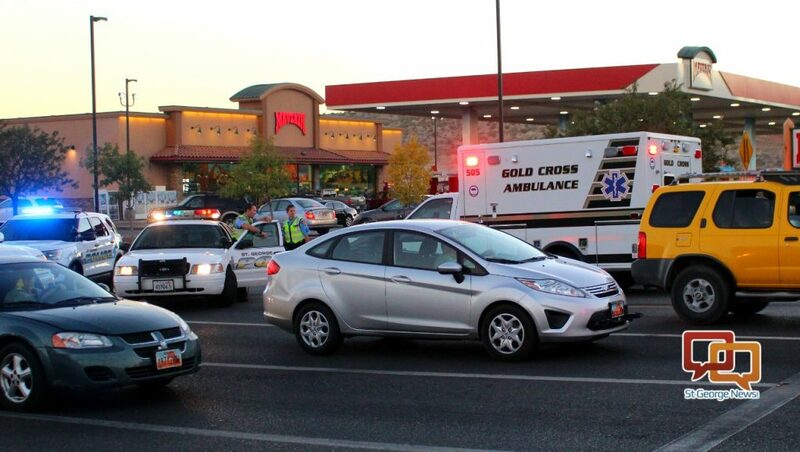 The woman also accelerated directly behind the truck, intent on turning left onto Mall Drive, and was struck on the passenger’s side of the vehicle by the eastbound SUV entering the intersection on a green light. 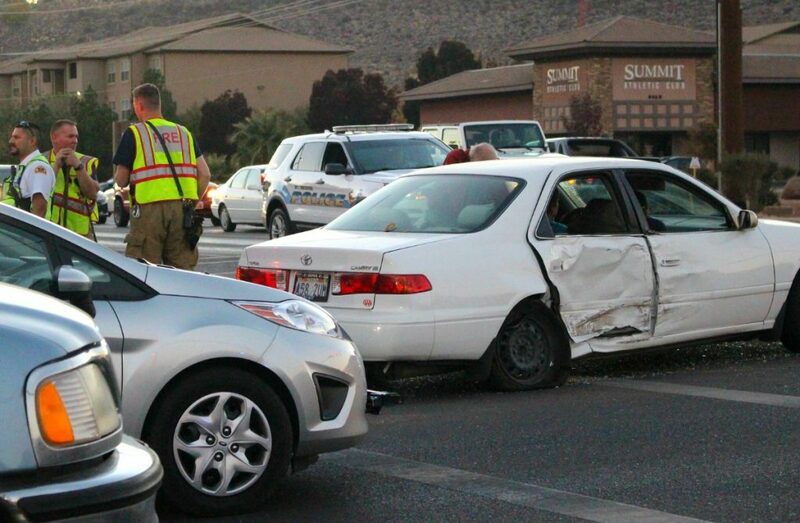 The impact spun the Toyota and crushed both passenger-side doors. The woman driving the Toyota told officers she was unaware that the left-turn arrow had turned red when she started into the turn and believed she could clear the intersection after making the turn. Multiple officers responded to the crash to clear the intersection and redirect traffic, along with firefighters and paramedics who tended to the chaotic scene. The local rednecks call this black plume, “Rolling Coal”. It’s a way for the rednecks to show their dislike for “Green Cars” or emission testing. Also if you didn’t know, they have to pay extra to make their big loud trucks shoot the black smoke out of their tailpipe. The driver in the accident should not have followed the truck blindly but said truck should be held at some point responsible. need to be tested with the new law? I don’t understand the dislike for green cars part. injury case, all the resources would be available because of cameras at most intersections now. You can observe multiple cars any day, any time, turning left on a red arrow. There is no enforcement on this dangerous stunt. Black cloud of diesel exhaust or not, you have to wait until ANY large truck in front of you makes the left turn before you can even see the traffic signal. I have noticed that quite often. The traffic lights are low in many of the intersections – again with or without the black cloud of exhaust you cannot see the traffic signals. I have noticed the same thing – too low to see the traffic signal if the truck in front is too big and it doesn’t have to be that big a truck. The only upside to waiting until the truck clears the intersection or Rolling Coal dissipates so you can safely make a left turn, this NYer has never been honked at – ha ha ha ha ha! It’s time to get rid of the blinking yellow lights and institute solid green, solid red, and SOLID YELLOW for ALL turning lanes in Washington County.